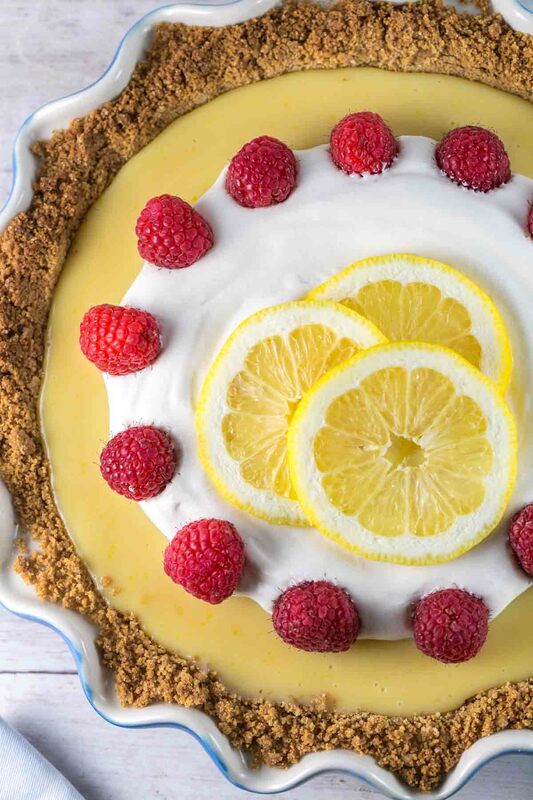 Silky smooth and sweet-tart, this easy lemon pie is the perfect spring and summer dessert (or anytime you want to pretend it’s summery!). 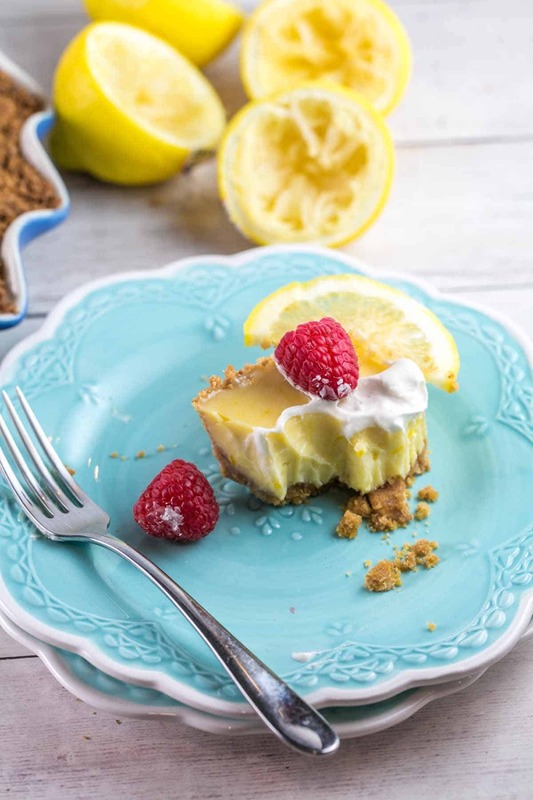 The lemon custard is made with only 3 ingredients, bakes in less than 20 minutes, and can be made ahead of time for easy entertaining. Brand new month… brand new pie for our 2018 Pie of the Month series! We’re inching closer to my favorite kind of pies: fruit pies! We started with lots of no bake pies to get us through the winter produce dearth (coconut cream pie, mint chocolate chip pie, nutella pie) . We’re not quite up to summer berry pies yet. But this month is a lemon pie, made with fresh lemon juice and lemon zest. Getting closer! When I started planning out my year long series of pies, April seemed like the perfect month for lemon pie. Bright, sunshiney, springy – everything you think of when it comes to both April in the mid-Atlantic and lemon. Except instead… we’re stuck in perpetual winter. On Monday, it snowed and sleeted. This weekend: more snow predicted. I probably should have made something more in line with this chocolate bourbon pecan pie if I wanted to be “weather appropriate.” Sigh. 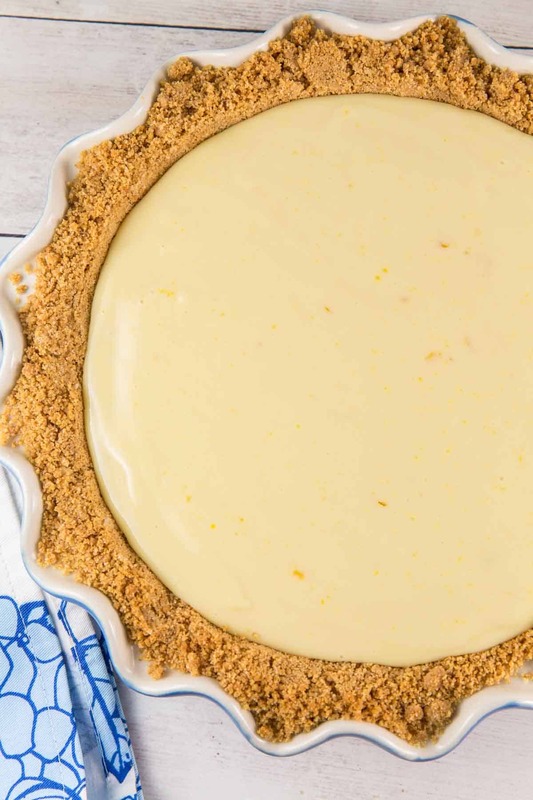 This creamy, dreamy lemon pie has the same base as a key lime pie: egg yolks and condensed milk, but lots of lemon (both juice and zest) instead of key lime juice. And that’s it! Three ingredients, plus a homemade graham cracker pie crust and whipped cream for topping. Super duper easy! There are dozens of different ratios for the egg yolk to condensed milk to lemon juice out there. 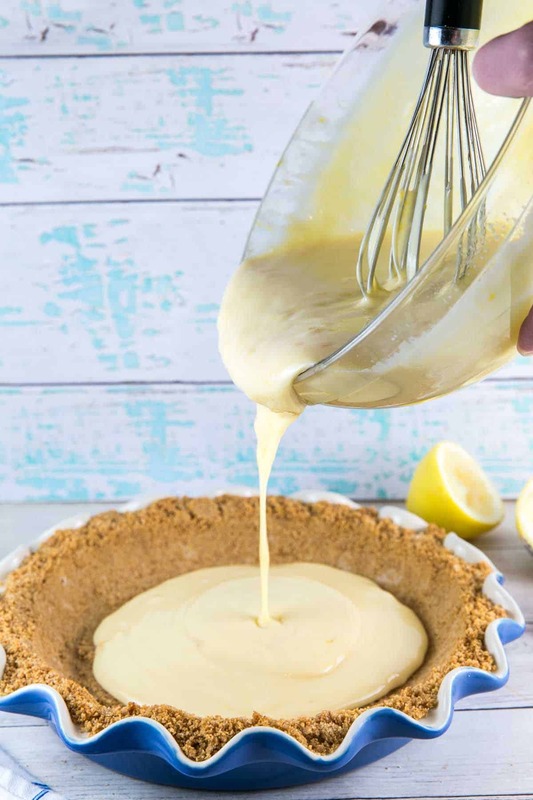 I love the sweet-tart taste of lemon desserts, so I wanted to play up the tart side of the lemon, adding extra lemon juice (and some extra egg yolk) to compensate for the extreme sweetness of the condensed milk. I have one request for this pie: use fresh lemon juice. I’m all about keeping a bottle of lemon juice in the fridge for cooking or adding a little bit here or there, but when it comes to this pie: fresh is best. Bottled lemon juice lacks the citrusy pop of the fresh stuff, and squeezing all those lemons is well worth the effort. I’m going to be honest here: this is one of my favorite desserts I’ve ever made, and that’s saying a lot, because obviously I make a lot of desserts. But there was just something about this lemon pie that I couldn’t stop eating. The silky smooth texture. The prominent lemon flavor. 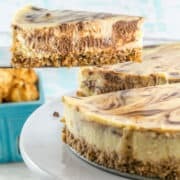 The crispy graham cracker crust. The pile of whipped cream and raspberries on top. All of it. Plus, you can make it ahead of time: the crust stayed nice and crispy in my refrigerator for 6 days. Or you can make it 3 months in advance and store it in the freezer. 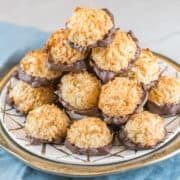 Talk about an easy dessert for entertaining! I don’t care if it’s going to snow again this weekend: I need more lemon pie in my life. And I’m pretty sure you do, too. 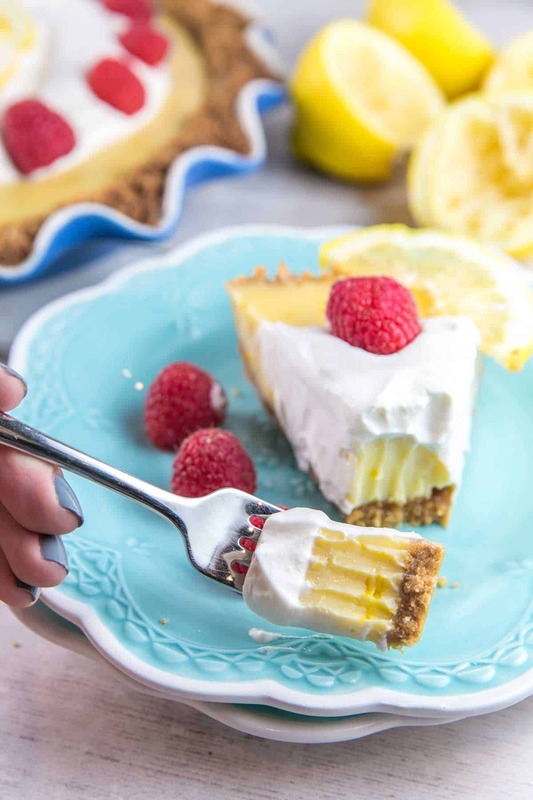 Silky smooth and sweet-tart, this easy lemon pie is the perfect spring and summer dessert (or anytime you want to pretend it’s summery!). Prepare graham cracker crust according to instructions. Remove from oven and let cool briefly while making lemon pie filling. In a large bowl, whisk together the sweetened condensed milk, lemon juice, lemon zest, and egg yolks until well combined. Pour into graham cracker crust. Bake the pie for 18-20 minutes, until pie is set along the edges and slightly jiggly in the center. 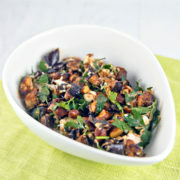 Remove from oven and cool to room temperature, then transfer to refrigerator and chill for 1 hour, up to a week. 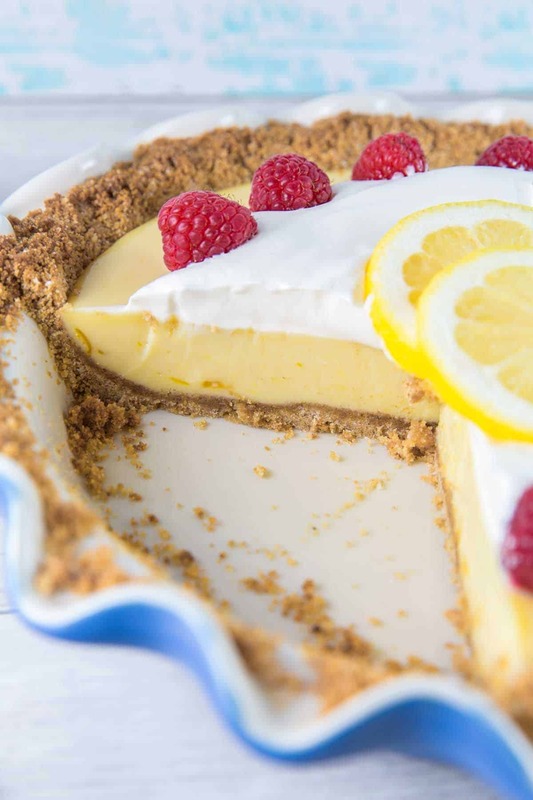 Top with desired garnish: freshly whipped cream, additional lemon slices, and raspberries. Pie can be made ahead of time. 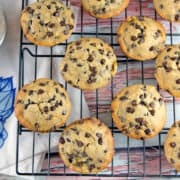 After baking, cool at room temperature, then loosely wrap with plastic wrap and store in the refrigerator for up to 1 week, or cover tightly with a layer of plastic wrap and aluminum foil and freeze for up to 3 months. Thaw overnight in the refrigerator. This dessert just screams spingtime! 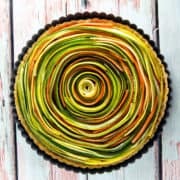 I love everything citrus and lemon tart is one of my all-time-favourites! 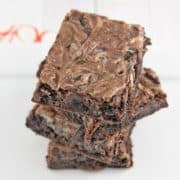 Your recipe sounds delicious and I am going to try it next week when the in-laws are coming over for tea! A) This looks insanely deliciously. Like sunshine, in dessert form. I need sunshine right now. And B) My husband is going to be in heaven when I surprise him with this. He’s such a big fan of lemon desserts. Pie of the month? I love it. And those raspberries are really making me think of Spring and getting past this Winter that is never ending. Lemon desserts are just my favourite, creamy sweet but refreshing. And yours looks so perfect. 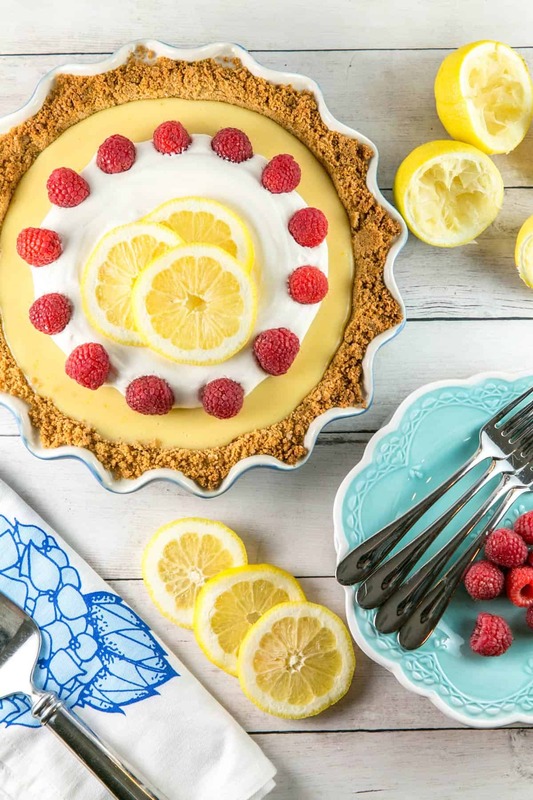 I’m all about lemons right now and your pie looks delish! Sorry it doesn’t feel like spring where you are. Unfortunately it’s already starting to feel a bit like summer here in Florida. Too hot for this time of year!! Spring is here, especially with this pie. Now all we need is for the weather to warm up, so I’ll have an other slice of that yummy pie while I’m waiting. 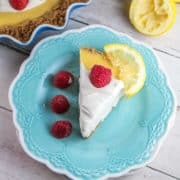 This lemon pie is going to cheer up my friend for sure..will plan to make this for her birthday.Like a cool breeze in this Summer. yummy! thanks for this recipe. Looks like a winner for me with the tart flavor over the supersweet. I love seeing what you’ve baked up all the time! Lemon pie is one of my favorites and always reminds me of my mother. Love that you didn’t do the typical meringue topping which can be challenging for non-bakers like me! This is definitely one I could do! 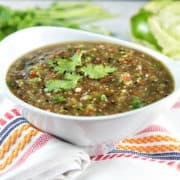 I would love to try this recipe, but because my stomach does not agree with eggs, I would not be able to. I can make it for my husband though. He loves lemons, and he will be so excited to try it. Wow! I need this in my life immediately. I love lemon and this looks right up my alley! 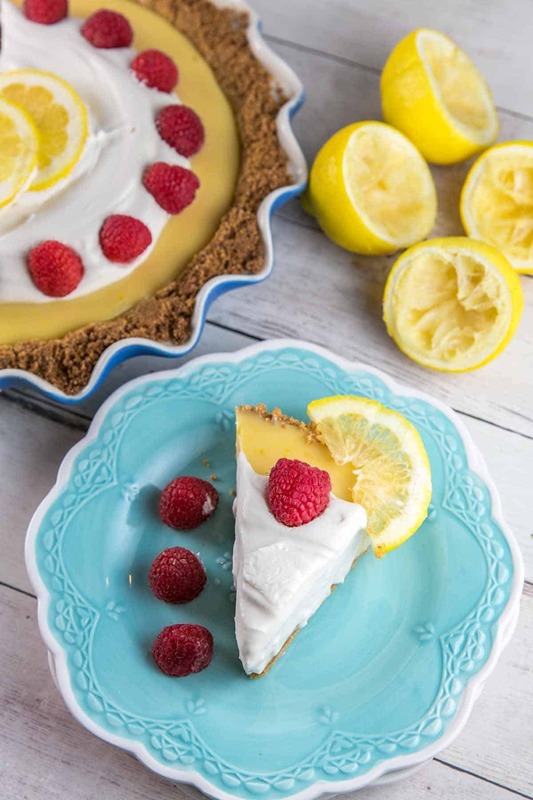 Like you, lemon desserts are my favorite! Made this last week and it was great! Wanted to make it again, and discovered I was out of graham crackers! Improvised with crushed Girl Scout Shortbread and Nilla Wafers! It’s in the oven mow, and I’m confident it will be good! Thanks for the blog! 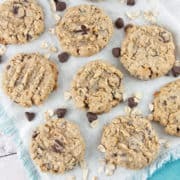 Oooooh crushed shortbread cookies sound SO GOOD! Now I want to try with them as well! !